2. Using the data thus analyzed to analyze the situation. The term data is defined as facts, graphs, statements, decisions, actions, descriptions, which are supposedly true. Situation is defined as the broad general scene on which a body of current data exists. 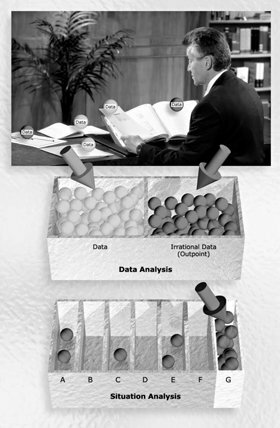 The way to analyze data is to compare it to the outpoints and see if any of those appear in the data. The way to analyze the situation is to put in its smaller areas each of the data analyzed as above. Doing this gives you the locations of greatest error or disorganization and also gives you areas of greatest effectiveness. Example: There is trouble in the Refreshment Unit. There are three people in the unit. Doing a data analysis on the whole area gives us a number of outpoints. Then we assign these to employees A, B and C who work in the unit and find B had the most outpoints. This indicates that the trouble in the Refreshment Unit is with B. B can be handled in various ways such as training him on the duties of his job, his attendance, etc. Note we analyzed the data of the main area and assigned it to the bits in the area, then we had an analyzed situation and we could handle. Example: We analyze all the data we have about the Bingo Car Plant. We assign the data thus analyzed as out (outpoints) to each function of the Bingo Car Plant. We thus pinpoint what function is the worst off. We then handle that function in various ways, principally by organizing it and training its executives and personnel. WE OBTAIN AN ANALYSIS OF THE SITUATION BY ANALYZING ALL THE DATA WE HAVE AND ASSIGNING THE OUTPOINT DATA TO THE AREAS OR PARTS. THE AREA HAVING THE MOST OUTPOINTS IS THE TARGET FOR CORRECTION. In confronting a broad situation to be handled, we have of course the problem of finding out what’s wrong before we can correct it. This is done by data analysis followed by situation analysis. We do this by grading all the data for outpoints (illogics). We now have a long list of outpoints. This is data analysis. We sort the outpoints we now have into the principal areas of the scene. The majority will appear in one area. This is situation analysis. Example: Seventy data exist on the general scene. We find twenty-one of these data are irrational (outpoints). We slot the twenty-one outpoints into the areas they came from or apply to. Sixteen came from area G. We handle area G.
The remarkable part of such an exercise is that the data analysis of the data of a period of one day compares to three months operating experience. Thus data and situation analysis is an instant result where experience takes a lot of time. One obtains an analysis of a situation by analyzing all the data one has and assigning the outpoint data to the areas or posts. The area having the most outpoints is the target for correction. The quality of the data analysis depends on one knowing the ideal organization and purpose on which the activity is based. This means one has to know what its activities are supposed to be from a rational or logical viewpoint. A clock is supposed to keep running and indicate time and be of practical and pleasant design. A clock factory is supposed to make clocks. It is supposed to produce enough clocks cheaply enough that are good enough to be in demand and to sell for enough to keep the place solvent. It consumes raw materials, repairs and replaces its tools and equipment. It hires workmen and executives. It has service firms and distributors. That is the sort of thing one means by ideal or theoretical structure of the clock company and its organization. Those are the rational points. From the body of actual current today data on the clock company one spots the outpoints for a data analysis. One assigns the outpoints to the whole as a situation analysis. One uses his admin know-how and expertise to repair the most aberrated subsection. One gets a functioning clock factory that runs closer to the ideal. Military, political and PR situations, etc., are handled all in the same way.